Zazen is one kind of Buddhist training method, a type of meditation where you try to concentrate your thoughts by sitting on the floor, crossing your arms and legs, and by breathing quietly through your nose. Normally zazen is done by Buddhist monks in training, but in Kyoto many temples offer everyone an opportunity to try zazen. Among these temples, Shorin-ji Temple, a sub-temple of Tofuku-ji, has a zazen session every day, and in a room where the image of Buddha of the temple, Bishamonten, is enshrined. The zazen session takes about an hour, and during this hour you meditate twice for 15 minutes at a time. Even if you have never tried zazen before, the priest of the temple will explain the concepts in an easy to understand manner, though in Japanese, but they also have a printed out paper on which you have the explanations in English. The zazen session at Shorin-ji Temple, which is right by Tofuku-ji, but still a quiet and tranquil place of relaxation, is a chance for you to take a look at yourself, which is also a reason why the session is very popular with foreign visitors. If you come to Kyoto, the home ground of Zen, how about having a real zazen meditation experience? The priest of the temple will tell you the proper way to sit and the proper hand position, and during the meditation you are supposed to keep this position. You take in slow, big breaths, and also exhale them slowly, and while doing this count from one to ten. You don’t close your eyes but keep them half open and focus your eyes around one meter in front of you. This is the proper way to do zazen. At Shorin-ji Temple both before and after the actual zazen meditation, there is a lesson by the priest in Japanese where he tells about Zen, zazen, and the kind of training priests go through and what kind of a role zazen plays in that. If the person doing zazen gets sleepy or his thoughts wander away, he would normally get hit by the Zen stick. The Zen stick is a tool of encouragement the priest uses by hitting the person doing zazen on both shoulders. In a zazen session of Buddhist practitioners, the priest decides who needs the stick, but during the zazen session he will only hit you if you put your hands together in a praying position when he is passing by. After the zazen experience, please take a look at the garden. The garden of Shorin-ji Temple is small, but you can see many seasonal flowers and the garden is very pretty. In early summer you can see blooming hydrangeas and lotus flowers. There are many maple trees so the autumn leaves at the temple are also something you have to see. 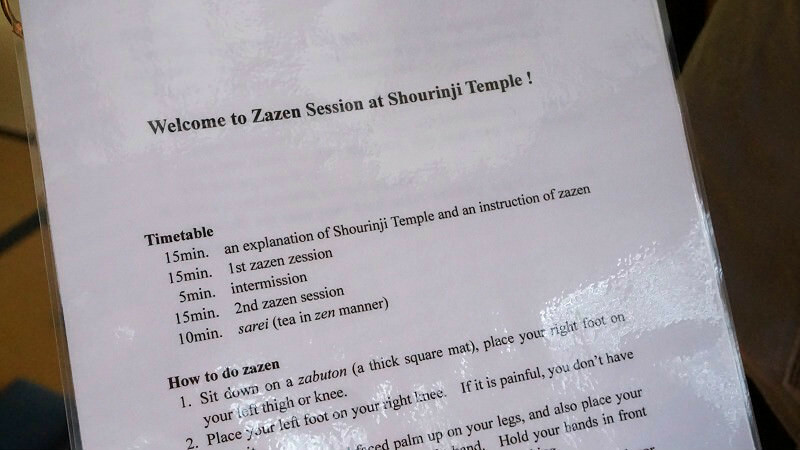 At Shorin-ji Temple they have a paper with explanations in English about zazen and how it is done for the foreign visitors. Notice that the oral explanations are not in English. If you want to take part in a zazen session, you have to make a reservation online. This was my first time trying zazen too, so all of it was new to me. The hardest part was keeping your mind concentrated; at least my mind tried to wander all over the place, and I also kept having to concentrate on my feet as I have not yet mastered the proper way of sitting for zazen. After the experience, I have found it easier to concentrate, so this experience is not only a cultural experience, but also something that can help you in your everyday life. Shorin-ji Temple is a 10-minute walk from JR Tofukuji Station. Besides the zazen experience, they also offer sutra copying and yoga sessions at Shorin-ji Temple. Adults: 1000 yen, high school students: 800 yen, middle school students: 700 yen, elementary school students: 600 yen. You can make a reservation online by going to Shorin-ji Temple’s English website and sending an email to the address written there, and you will get a reply in English. The priest at the temple is very friendly so even zazen first-timers can easily join the session. Gaze through the whole of Kyoto city from this symbolic tower!